Enter to win a VIP Vacation in the #RockYourVacation Instagram Contest! Have you seen me and my blogging friends Tweeting and Instagraming about the #RockYourVacation Instagram contest this week? Well, the contest officially kicked off on Monday, and I want YOU to go enter! The Rock Your Vacation Instagram Contest is SUPER easy to enter! First, make sure that you are following @ExperienceKissimmee on Instagram. Then create a 15 Instagram video explaining how you would rock your vacation in Kissimmee. You can be as creative as you want, and you can create as many different videos as you like! Just make sure to use the hashtag #RockYourVacation when you post it to Instagram! You can tag @ExperienceKissimmee when you post your video, but it’s not required. The Experience Kissimmee team is watching the hashtag, so they’ll see your video as long as you hashtag it! One grand prize winner will receive a VIP trip to Kissimmee for themselves and up to five guests. This is perfect for families or a group of friends who need to escape the monotony of daily life and party like Rock stars in Kissimmee! This trip has a total value of $10,000! In addition to the grand prize, five (5) entrant secondary prize winners will each receive a Samsung GALAXY Camera Wi-Fi (White). Plus, seven (7) voting winners will each receive a pair of Beats by Dre Solo headphones. So even if you don’t win the grand prize, you can still win something awesome! That Samsung Galaxy Camera is pretty amazing and those Beats by Dre Solo Headphones are pretty cool too! So what are you waiting for? Go upload your video to Instagram and enter to win the VIP trip of a lifetime! Oh…and for an extra special incentive, we are holding an on-location #RockYourVacation Twitter party on February 5th from 2 to 3 PM EST, where we will be chatting about the Instagram contest, all of the awesome things there are to do and see in Kissimmee, and we will be giving away Kissimmee prize packs full of fun Kissimmee stuff! There’s no RSVP necessary, just show up and tweet with us to win fun prizes! 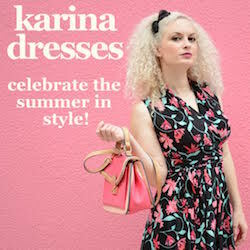 « Enter to Win a New Dress Wardrobe in the Karina Dresses#Dresstacular Giveaway! I so want to win this! What an awesome contest! Thanks! Love kissimme, we live so close to there we are there often – so many fun things to do and see! Kissimmee is my family’s favorite vacation destination. This is such an awesome contest! I have never been to kissemmee but it sounds really FUN! This is such a generous giveaway. I would love to win and take my kids! What an amazing contest! I will definitely be creating a video with my little ones! I’d be stoke with one of the cameras! Thanks! You look so relaxed with that gator. Like “no big deal… just holding this alligator”. LOL Adorable!!! Super easy and super fun. I’m an INstagram junkie right now! Great prizes! My daughter has been asking for a Galexy camera for her birthday. I need to enter to try to win 2nd place prizes! Awesome contest. I would definitely love to win this one! Oooh, I love Instagram giveaways. I will definitely be thinking about entering this one! Thanks for sharing the info! Sounds like a super cool contest! I will be very jealous of the lucky winner. I’m probably the last person online not on Instagram, but this contest looks awesome! I’ve been to Gatorland and that place is awesome! I can’t believe the trip include such an insane house rental too!!! I’d love a vacation away. I still don’t know how you cold hold that man eater and be smiling. Haha! not sure how to do a 15 Instagram video- but I’m gonna upload it tonight?